Mindful recovery retreats are offered as an opportunity to experience a wholly Buddhist approach to life after addictions and compulsions. Retreats are open to those new to recovery as a support to an ongoing abstinence, or abandonment of harmful behaviour. Those who have been in recovery for a longer time – perhaps 12-step, SMART or otherwise – are also very welcome to discover an alternative and complementary approach to recovery. 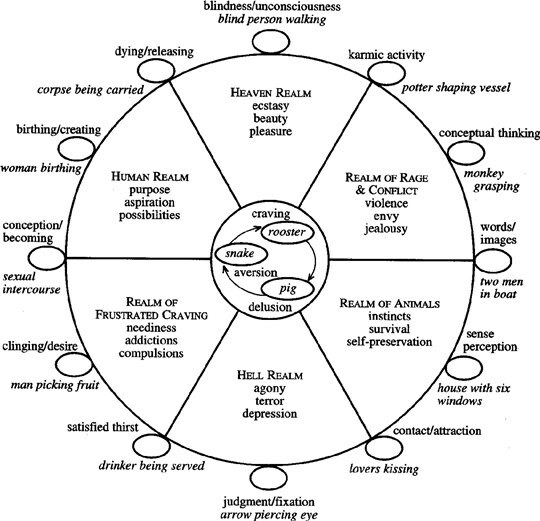 All retreats vary in their content and focus but they generally make use of a modern depiction of the Buddhist Six Realms [mind-states] of Existence as a model for addiction and recovery. 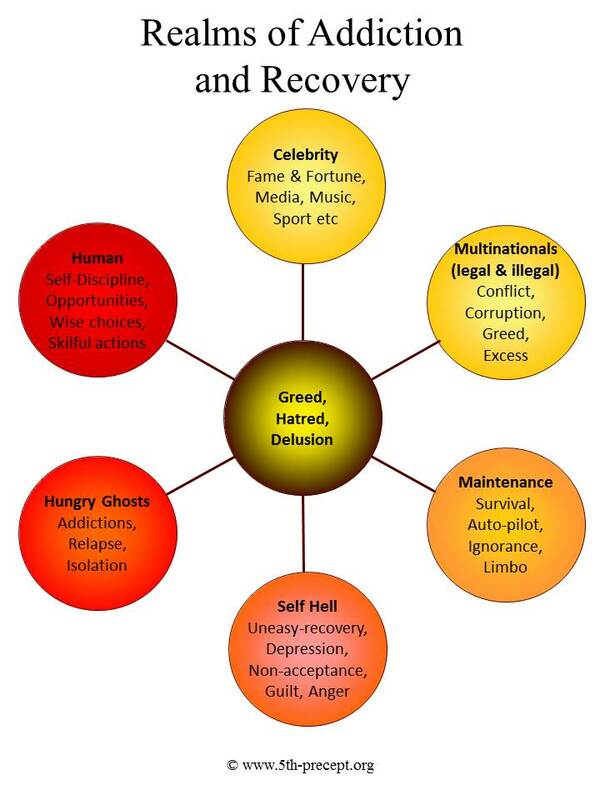 The ancient traditional principles and practices of of Sajja (seeing the truth of our addiction & our commitment to change) and Sila (the Buddha’s original harm reduction & relapse prevention programme) are presented and explored as foundations of a Buddhist approach to recovery. Each retreat will normally include periods of sitting, standing, walking meditation and mindful Qi-gong. It is important to note that you do not have to be a Buddhist to practice Sajja, Sila, meditation or mindfulness. Recovering people of all faiths and none are welcome on these retreats.The essential practises of Loving-kindness and Forgiveness – for healing our hearts and minds in recovery – are central to recovery practice and are woven into our daily schedule. 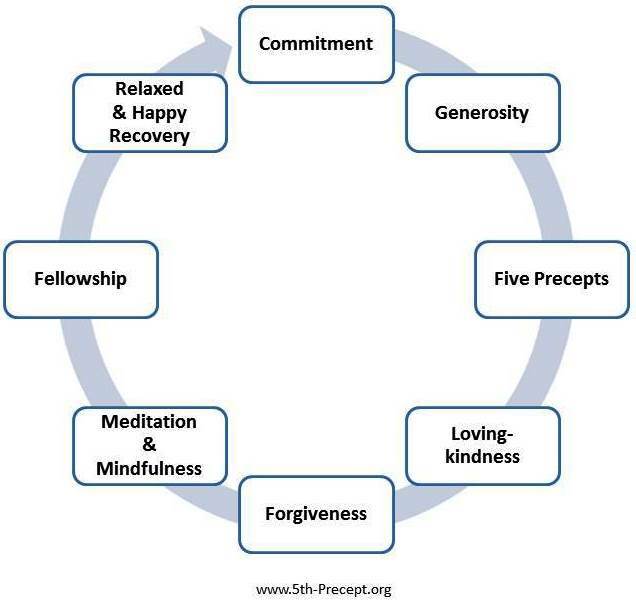 For the period of all retreats, everyone is required to commit to the training guidelines of the Five Precepts – the ethical training suggestions that are focused on developing personal harmless conduct (Sīla). To refrain from intentionally harming any living being including ourselves. To refrain from stealing or taking what is not freely offered. To refrain from sexual and sensual misconduct. To refrain from false speech (also idle gossip, harsh and divisive speech). To refrain from taking substances which disturb the balance of the mind (and may lead to transgression of any or all of the above guidelines). Dana : The retreat teachings are offered in accordance with the Buddhist tradition of Dana (the practice and virtue of generosity) where the retreatant is invited to contribute financially to the teachings and the mentoring based on their individual income and the value that they place on what has been offered. The livelihood of the teacher is – in part – dependent on the generosity of Dana. There will be more details of this on the retreat. To ensure that any retreat is right for you, please read all the information provided carefully. Don’t hesitate to contact us with any questions you may have.